« Welcome to Eastern Shore Gardener and Hackberry Point! 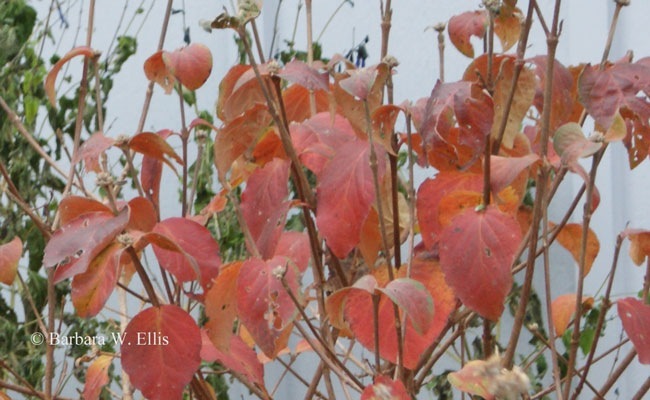 Both the species and its cultivars boast incredibly beautiful fall foliage. Leaves are dark green in summer, and they turn to shades of red and red-purple once cool weather arrives in fall. One thing that would improve the fall foliage display on the plants in my garden is more wind protection: Plants in sites protected from wind would hold their leaves longer. 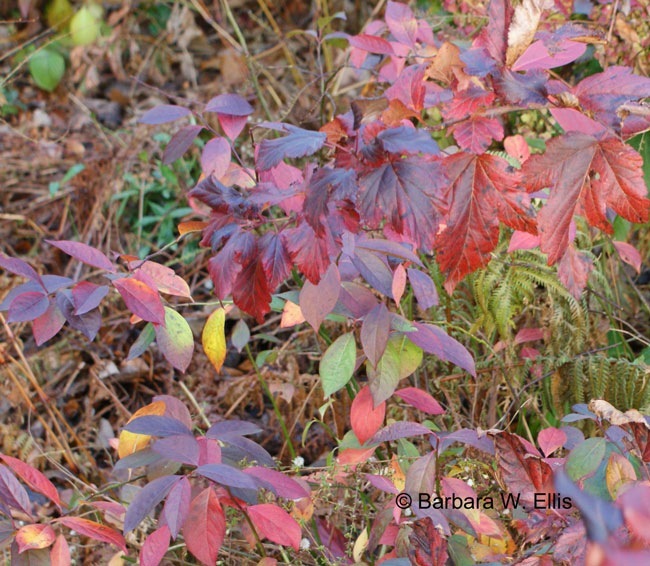 Another must-have for gorgeous late fall foliage is Virginia sweetspire. (This picture doesn’t do the plant justice: I plead gray, overcast weather on the day I photographed it!) Once fall arrives, mid-green leaves turn to shades of yellow, orange, red-purple, burgundy, and red. A drift of sweetspires is simply stunning in fall. The species ranges from 3 to 5 or more feet tall, and clumps generally are quite a bit wider than they are tall, making them very effective ground covers. Add to that the fact that plants produce racemes of lightly fragrant white flowers in summertime when few other plants are in bloom and you have a plant that deserves to be found in many more gardens than it is. What’s not to love? If great foliage and flowers isn’t enough, sweetspires also are very adaptable. 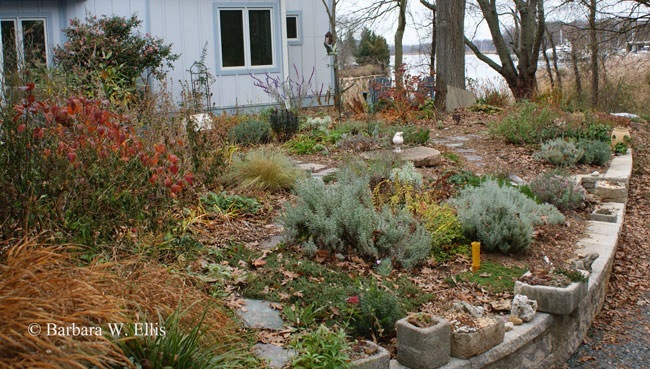 Plants tolerate sun to shade, thrive in moist to wet soil, and are remarkably drought tolerant. They spread by suckers to form handsome mounds. Plants can also be dug and divided. ‘Henry’s Garnet’ was selected for its exceptionally brilliant fall foliage, extra large flowers, and somewhat more compact (3 to 4 feet) habit. It won the Pennsylvania Horticultural Society’s prestigious J. Franklin Styer award in 1988. I also grow ‘Little Henry’, which is slightly more compact and also features wonderful red-purple fall color. 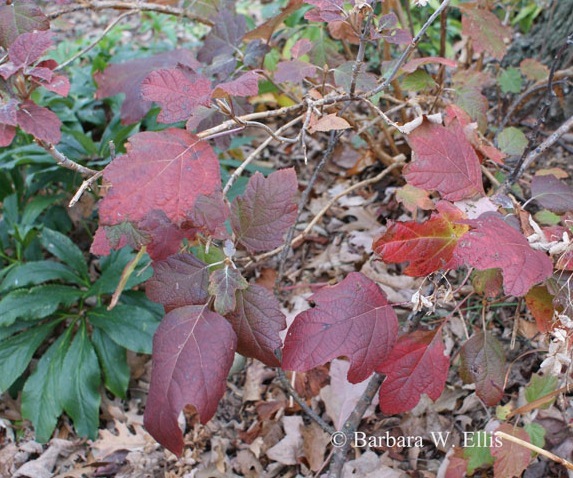 Native ninebark is another outstanding shrub with fall foliage appeal. In spring, the leaves of ‘Center Glow’ emerge greenish-gold flushed with burgundy around the edges. The burgundy color fades a bit during the heat of the summer, but once temperatures drop in fall the leaves turns rich burgundy red. Ninebarks reach 5 to 10 feet in height. The arching branches spread to form a tall mound that is nearly as wide as it is tall. Plants bear white or pinkish flowers in early summer. The small individual blooms, which resemble spiraeas, are carried in rounded 1- to 2-inch-wide, buttonlike corymbs. Because of their rangy habit, ninebarks aren’t good plants for small landscapes. They do make nice additions to shrub borders. I’ve planted them in some of the toughest sites on our property and found them to be quite able to tolerate poor soil and dry conditions. Plants can be cut to the ground in late winter if they become too large or rangy for their site. Viburnums also often bring rich foliage color to the garden, including V. carlesii, commonly known as Korean spice viburnum and the various cultivars of doublefile viburnum (Viburnum plicatum var. tomentosum). None of my viburnums are in protected locations, so winds whipped the leaves off most of them a few weeks ago. Still my Koreanspice viburnum is worth mentioning. 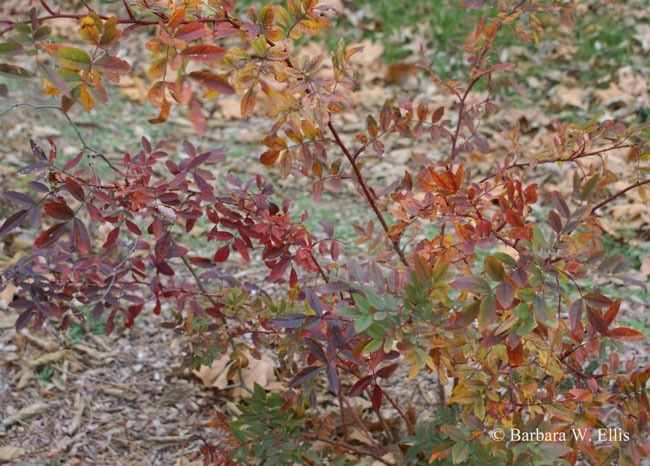 It exhibited rich red, orange, and maroon-red foliage this fall until the most recent deluge and windstorm rendered it leafless. My plant is the relatively rare ‘Compactum’, which only grows to about 3 feet tall. Like the species, it brings incredibly fragrant white flowers to the garden in early summer. 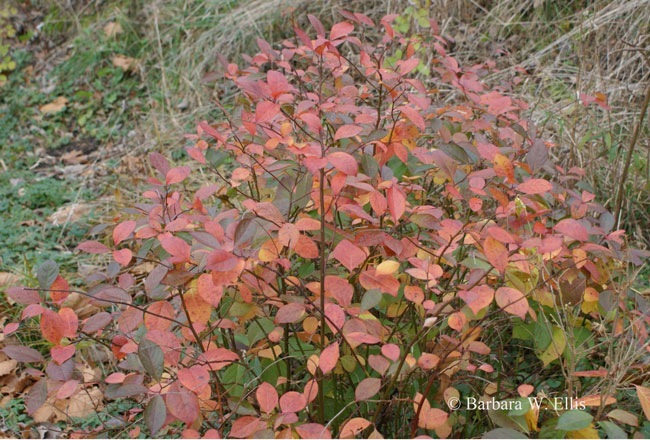 Another native species, Virginia rose, is a surprise addition to this list of plants with colorful fall foliage. I don’t normally think of roses for much more than summer flowers. (Fall flowers, too, since my hot-pink Knockout ‘Radrazz’ is still blooming!) To have one that brings colorful fall foliage to the garden is especially exciting. My Virginia roses are still small plants grown from seed I obtained through the Hardy Plant Society, Mid-Atlantic Group, seed exchange. The plants haven’t bloomed yet, but eventually they should produce fragrant, single pink flowers. This is the first year I’ve had any seedlings in the ground, and they haven’t disappointed even though the plants are still small. (I also have some plants still in pots.) My main clump is thriving out near the road at the end of our driveway where it receives a minimum of attention, and yet still has managed to look nice and begin to fill in. The colorful fall foliage—in shades of maroon-purple, orange-red, bronze, and yellow—has been a valuable addition to the landscape. 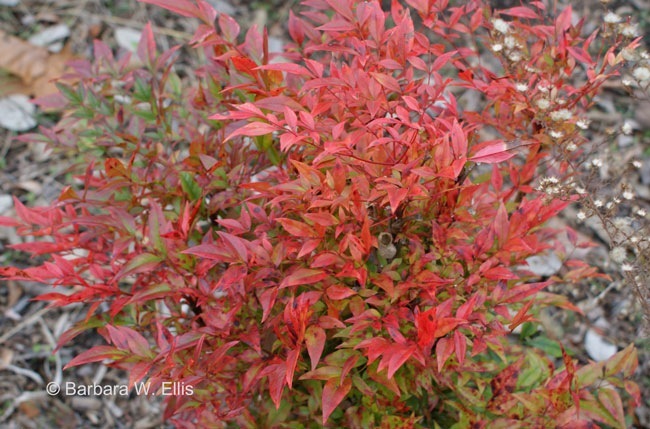 The final shrub I want to briefly mention is nandina ‘Gulf Stream’. It’s one of several dwarf cultivars I have growing here that were selected for their colorful fall to winter foliage. The color here speaks for itself. ‘Gulf Stream’ ranges from 3 to 3 1/2 feet tall tall and wide. My plants haven’t spread enough to work as a ground cover, but underplanting them with something herbaceous would work to cover ground nicely. For me, the closer we get to winter, the more value I place on plants that can add a late splash of color to the landscape. It takes a different eye to find and appreciate color in the garden from late fall to early winter. Gone are the saturated hues from the height of the growing season. Combinations become more subtle and somber but no less beautiful. And while I love finding stray flowers I can cut and bring indoors this time of year—and I still have stray salvias and lavenders in bloom—the shrubs featured here are all worth growing because of the dependable show of brilliant foliage they will provide you for years to come. Hi! They are all pretty widely available, both by mail and from local garden centers. You can also buy all of them from Adkins Arboretum, and support the arboretum in the process. Near Chestertown, I’d look at Speakman or Kingstown Farm, Home, and Family.